Never suffer from writer’s block again. Ever! I read posts occasionally from writers who claim to be suffering from what they call Writer’s Block. Isn’t that goofy? They’re writing about not having anything to say. Isn’t that writing? I’ve written about writer’s block before in this space, but today I’m offering a permanent, guaranteed cure for writer’s block. If you’ll do these two things consistently, you’ll crush that writer’s block demon forever. I keep a notebook right by my mouse pad. Sometimes I’ll be writing a post or an email and get an idea for another post, or something I need to do that day. My notebook is full of reminders, lists, notes-to-self, addresses, phone numbers, Bible quotes, passwords, emails, quotes, tweets, recipes and more. I don’t feel comfortable writing at my laptop without my trusted notebook at my fingertips as well. I can’t count the number of times I was thinking and praying about writing a blog post. I thumbed through my journal pages and found just what I was looking for: the inspiration for my next blog post. 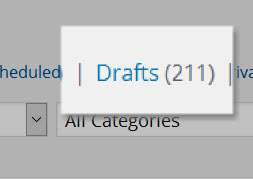 As I write this I have 211 post drafts in my draft folder. Some drafts are completed posts, some are guest posts, some are posts with content and no title, some are posts with titles and no content, some are sketchy rough drafts, some are quotes I may use in future posts, some are just notes-to-self about a topic or subject I’d like to blog about later. When I’m needing inspiration for a blog post, I merely scroll through my drafts until something jumps off the page and becomes fodder for a new blog post. Do these two things and you’ll never suffer from writer’s block again. Guaranteed. Editor’s Note: If you still can’t think of anything to write about after you’ve flipped through your notebook and exhausted draft topics, you may have to concede that you don’t have something to say. (Remember the first rule of all writing is: have something to say. Do you think this will help your writing? I’d love to get your feedback on this one. holy cow! I can’t seem to leave a draft alone. If I start a post I can’t just stick it into the drafts and leave…it has to be finished. Great ideas though. will try that notebook next to the puter and see what happens. I feel the same way. I hate to see a non-zero number in my drafts folder. Now, I might keep drafts as backup just in case because I don’t want to lose the work. Other than that, all text that goes on WordPress must be finished posts in a short amount of time. Regardless, these are pretty good ideas. Notebooks have helped me in the past. Dear Shmaltz, thanks for the great comments. Even if I start a post and can only think of a few things to say, I’ll stick it in my draft folder. Like you say, and I agree, “I don’t want to lose the work.” Great thoughts. Suze, would you consider walking away from a post in progress for 30 minutes? for an hour? For an afternoon? For a day? I promise you this: if you’ll just walk away, do something else, get your mind off the post, when you return you’ll see things you didn’t see before. You’ll find little ways to improve your post, or use better expressions, or find misspelled words or whatever. I guarantee you will. This is not just a good idea. I practiced this in every writing job I ever had. It didn’t matter whether I was on a tight deadline, or had clients waiting. Leaving my post ALWAYS made the piece I was working on better. i can see me just erasing everything and starting over again.lol…no, i see the point. When I was grant writing I did this constantly. with the blog, i don’t know. do I really want to be careful with my composition? Do I really want to punctuate properly? not really. I just want a record of what I am doing or thinking at any given time for the boys. Would my blog be better? of course it would. But I have a feeling that were I to take the time to really have a great blog with a bunch of followers waiting for my every post, it would become something I have to do as opposed to something I do for enjoyment. And life is too short for me to worry about it. Totally your call, Suze. If you’re writing for your boys and they don’t care, it doesn’t matter what others think. It’s the English and Creative Writing teacher in me that compels me to want to help others. I don’t ever meddle in others’ blogs unless they ask. I completely accept your ideas to combat Writers Block to create new ideas to blog about. The problem of sustaining one’s writing for a length of time is a separate challenge in blogging. I seem to have found my voice in the 4-5 paragraph format. Excellent, usfman, Thanks for the good comments. When I first started out I was writing short novels. My word count was all over the place, even as much as 1,100 words. I read some very good short posts now regularly. I cut mine back to about 250 words or so for awhile. I still try to keep my posts 2-300 words, sometimes I get to 400, but rarely. As a former reporter and editor, I try t stick to making one, rarely two major points. I’ve found my readers like those 2-300 posts better as well. Great that you’ve found your niche in 4-5 grafs. If you’re like me, you’ll feel more gratified when you achieve that 4-5 graf foal. Good luck, and thanks for the comments.